​Read the memories shared at Sister Mildred's funeral. 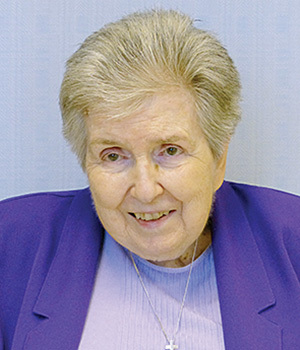 Word has been received of the death of Sister M. Mildred Louise (Mildred Louise Keegan), CSC, who died at 5:40 p.m. on February 2, 2019, in Saint Mary’s Convent, Notre Dame, Indiana. 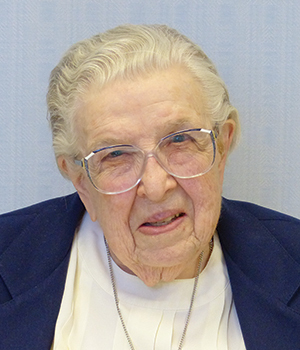 Sister Mildred Louise entered the Congregation from Washington, D.C., on July 31, 1938. 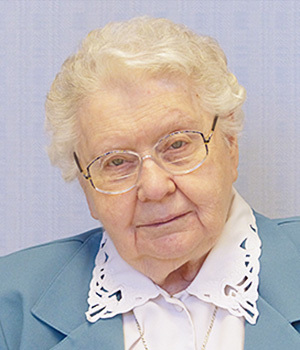 Her initial profession of vows took place on February 2, 1941. “Now, Lord, you may dismiss your servant in peace” (Luke 2:29). 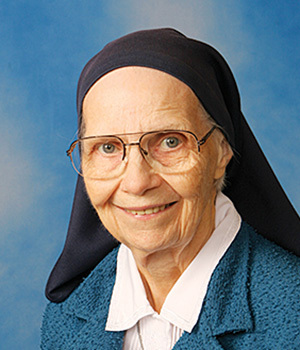 Sister M. Mildred Louise died at Saint Mary’s Convent on the 78th​ anniversary of her initial profession as a Sister of the Holy Cross. The “bright and dark tints of life’s joys and sorrows, separations and reunions” were threaded through ministries in education, catechetics, pastoral services, finance, teacher training and formation across continents in the countries​ of Brazil, Guatemala, Uganda and the United States. 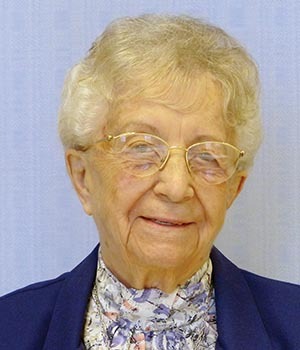 Sister Mildred Louise cautioned that the flip-side of the canvas or tapestry was a little messy after so many years, but she trusted God to give her a “gentle touch-up” before bringing this work of her life to completion. Mildred Louise was the daughter of Mary Turner and Harry Keegan in a family of 10 children. The Keegan’s claimed Washington, D.C., as their home. “Millie” met the Sisters of the Holy Cross when she attended Saint Cecilia’s Academy on Capitol Hill and applied to the Congregation at age 19, after working for a year in a government job as a secretary. 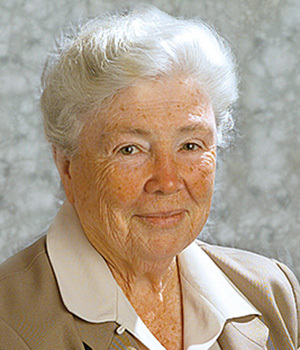 In the convent, Sister Mildred Louise was amply prepared professionally with a Bachelor of Arts in Education from Saint Mary’s College, Notre Dame, Indiana (1961); a Master of Arts from Saint Mary’s School of Theology (1966), and a Master of Arts in education​ from the Pontifical Catholic University, São Paulo, Brazil (1959). Another Master of Arts in education at Xavier University satisfied stateside requirements (1979). 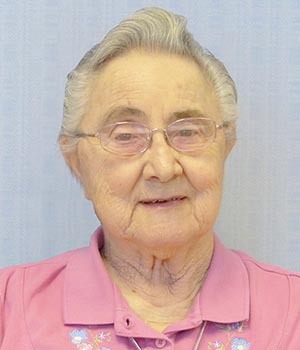 Sister Mildred Louise may have started in 1941 as a teacher in classrooms at St. Paul’s School in New York, New York, and Chevy Chase, Maryland, but her heart was always in mission. From 1949 to 1963 she served in Brazil in every educational capacity at the Sisters of the Holy Cross Foundation in São Paulo. She was a spiritual mentor and teacher for young women being formed to consecrated life at Saint Mary’s from 1963 to 1965 and for the Association for Religious in Uganda at Jinja and Ibanda​, Mbarara, then the Banyateresa Novitiate in Fort Portal from 1968 to 1972. 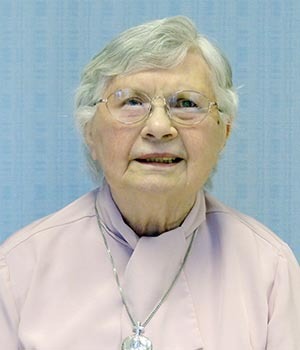 Sister Mildred Louise served locally in South Bend, Indiana, when she stepped in temporarily to assist the Religious Education Office for the Catholic Diocese of Fort Wayne-South Bend in 1973. 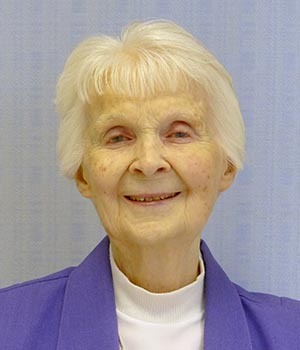 She was a chaplain in Columbus, Ohio, twice at Mount Carmel Medical Center from 1974 to 1979 and 1985 to 1986. Written by ​Sister Catherine Osimo, CSC. I am now 73 years old and have been reminiscing with a classmate of mine at Blessed Sacrament School in Washington, D.C. which was staffed for many years by C.S.C. Sisters. We have very fond memories of so many of our wonderful teachers! I am wondering whether the Congregation would be able to provide us with information about our beloved sisters all of whom are now deceased. My friend and I have contacts with a number of other classmates who also have expressed a desire to know something of these women who were pivotal in our lives. Thank you. By the way, we remember all their names.